Stay on top of your business in no time with complete controls. Create as many custom fields based on your needs. Get more tracking and controls. Offer higher personalised care to your contacts. Get all insights in a single dashboard. Take various actions in just a click. Managing activities was never so easy. Track various activities in a timeline fashion. Get better audit and controls on all activities. Never loose control on whats going on. Smart metrics for quick analysis and decision making. One click actions for routine items. Stay on top of your business quickly. Track every minute spent by every team member. Delegate to support staff without sharing your access. Audit features for greater clarity and peace of mind. Track every dollar spent by every team member. 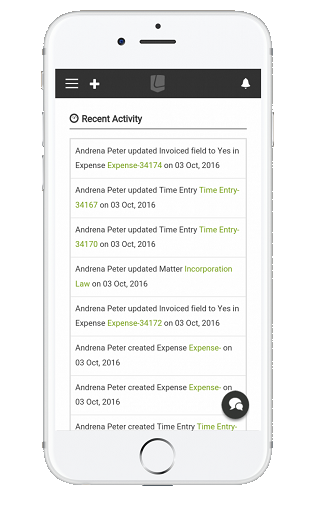 Whether its time tracking, expense, task or billing – get more from everything with deep integration between all facets of a matter. Analytics and dashboards for each matter gives you complete controls. Get updates on all activities about a contact or matter. Smart audit features for higher traceability. Never miss any deadline. Never loose any controls on your business. 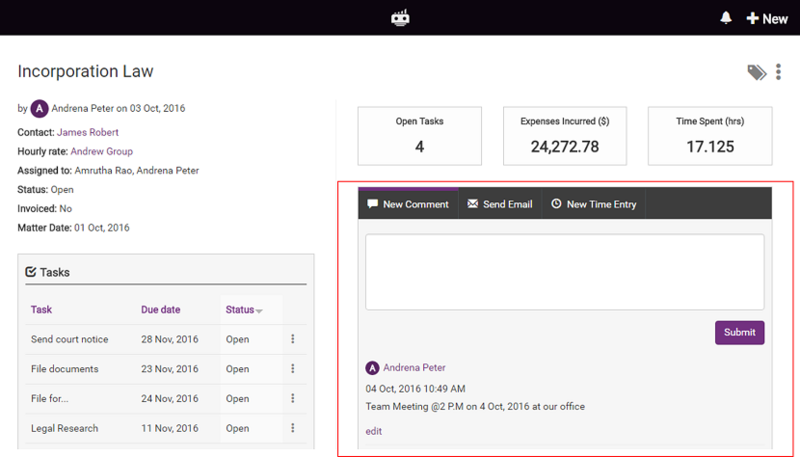 Collaborate with entire team in real time. Add notes and comments to anything. Communicate directly from the system. Keep complete history in one place and reduce unproductive email communications. Add custom fields for deeper tracking and more personalised care. Track tasks even without deadlines and get smart updates and agenda right in your mailbox. With money finder never worry about losing even a single dollar. Get meaningful insights about your business to stay on top of it. Never lose track of what you deliver, what you owe and keep client happy. Export all your data anytime, anywhere. Share invoices with your clients in no time. Get paid faster and keep your finances under control. 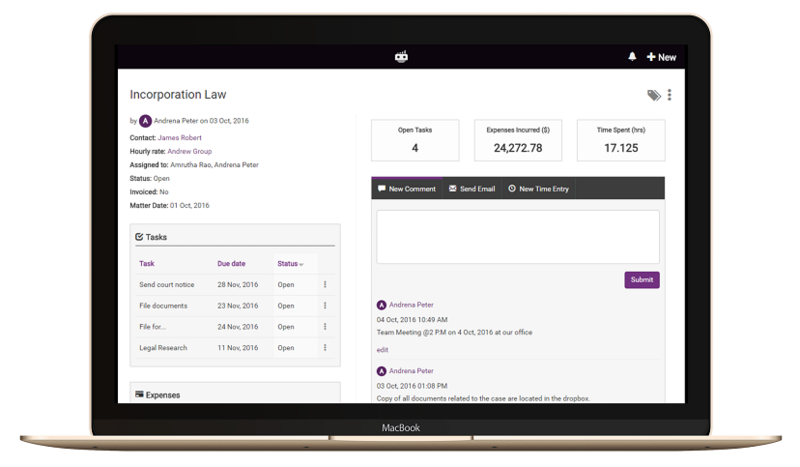 Delegate entries with built in audit controls and without sharing your access. Send updates, share invoices and share proposals right from the App. Keep track of everything at single location. Collaborate with your whole team and get real time updates and progress. Maintain data confidentiality and security with different access levels to support various roles. Work with local or distributed teams and clients. Ensure success for all. Manage your practice in Your currency, Your language and Your time zone. Its designed for You. Get started in no time and spend zero time on training. No learning curve and complex workflows to keep life simple. Whether you are on the go or at office, manage your practice seamlessly with our iOS and Android apps. Keep up with Law Firm Growth Techniques.